Made from heavy-duty fabric, the apron will keep your clothing free from splatters, while the attached towel is the ideal place to wipe your hands during the process. When you’re all done cooking, simply unzip the towel and use it to clean up. Complete with multipurpose pockets. 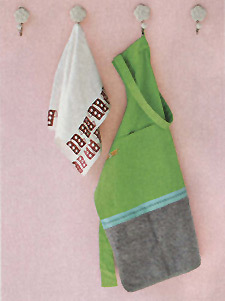 The zippered dishtowel could easily be added to the bottom of any apron as a simple DIY project. However, at $25, it’s not a bad price for an apron. Either way, I like that this design was made with an actual cook in mind.